Besides offering Nova walker parts here, we also carry Rollator accessories such as travel carry bags, eating trays, under-seat pouches, replacement seats, seat pads and more. We offer all Nova medical supplies and Nova Rollator parts in our inventory and even provide free shipping on most items. Replacement Basket for Nova Cruiser De-Light Rollator. Replacement Basket for Nova Mack & Mighty Mack Rollators. Fits 4215 and 4216. Nova Traveler 4900 replacement Folding-Hinge, fits Nova Traveler 4900 3-Wheel Rollator. Lock-N-Load device keeps Nova Rollators from unfolding while picking it up. Fits most Nova Rollators. Nova Anatomical hand grips fit 4202/4207/4215/4214/4900, 4216 and Zoom rollators. Nova rubber hand grips fit 4200, 4201, 4200C, 4208 rollators. Sold in pairs. 5" replacement wheel set for Nova 4200 & 4200C Cruiser Rollator. 6" replacement wheel for Nova 4203 GetGo and 4202C Cruiser Classic Rollator. 6" replacement wheel for Nova 4207 and older 4202 Rollators using 6" caster wheels. 8" Replacement Wheel for Nova Mack/Mini Mack Rollator 4214/4215. Factory replacement wheel includes hub and bearings. 8" Replacement Wheel for Nova Mighty Mack Rollator 4216. Factory replacement wheel includes hub and bearings. 8" replacement wheels for Nova Traveler Rollator - series 4900. NOV-C49006. 8" Replacement Wheel for Nova Zoom Rollator. Nova Anatomical hand grips fit 4203, 4212, 4200 rollators. Nova Traveler 4900 replacement basket part# C49010. Basket fits Nova 4900 only. Replacement brake cables for Nova Rollators. Sold by Pair. Replacement Brake for Nova Rollators. Nova replacement brake housing and cable. Replacement brake cable cover for Nova Rollators. Nova Cane Holder works on all Nova Rollators as well as most other brands. Two clip cane holder keeps cane secure to frame. Nova CH-1000 Cup Holder for Rollators, Walkers and Wheelchairs. Cup Holder mounts to the frame and folds-up when not in use or during transport and storage. This Flashlight from Nova easily mounts on the handlebars of walkers and rollators and back canes or arms of wheelchairs. Lights up the path at night and let others see you. Front replacement fork for Nova Rollators using 5" Wheels. Front replacement fork for Nova Rollators using 6" Wheels. Fits older 4202 Cruiser Deluxe Nova rollators. Front replacement fork for Nova 4200/4203 Rollators using 6" Wheels. Front replacement fork for Nova Rollators using 8" Wheels. Fits 4202/4207/4214/4215 Rollators. Front replacement fork for Nova Mighty Mack Rollators using 8" Wheels. Fits model 4216 Rollators. 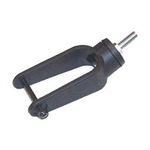 Handle Silencer for Nova 4203/4212/4202C/4900 Rollators. Handle Silencer for Nova Mack (4215) and Mini-Mack (4214) Rollators. Locking Loop Replacement Brake for Nova Rollators. Nova replacement brake housing and cable. Replacement Pouches for Nova Rollators - all models available. Rear axle screw for Nova 4202/Cruiser Deluxe and 4207/Cruiser Deluxe Junior Rollators. Wheel Bearing for Nova 8" Wheel. 5 per Bag. Nova Seat & Back Covers. Set your walker apart from all the others. Spring Release for 4202 Back Rest Bar. Nova Knee Cruiser TKC-8 replacement parts. Nova Rollator Transport Bag. Protect your equipment and keep everything together in one Travel Bag. This Carry-Bag from Nova works for Transport Wheelchairs, Rollators and Walkers. Nova Traveler 4900 replacement Tray part# C49011. Tray fits 4900 only. Food and beverage tray for Nova rollator. Replacement Under-Seat Pouch for Nova Rollators. Pouch for Nova Traveller Rollator model 4900. Fits Traveller 3-wheel rollator/walker. Nova GetGo Groove 4204 Rollator Replacement Parts. Buy factory replacement parts for the Nova GetGo rollator here. Nova Replacement Plastic Seat and Padded Seat Accessory for 4200,4203,4212 Rollators. PHC offers a comprehensive lineup of the top selling rolling walkers in the business – made by Nova. Nova medical products are well respected in the industry and accepted as being one of the best by experts and everyday users alike, whether you've selected a Zoom, Cruiser, Cruiser Jr., Vibe or GetGo. While these units are all made durable, and with years of carefree use expected, there are certain parts that may eventually need to be replaced. Wheels are a good example of parts that wear out.